-These bags can be used to store gifts, jewelries, snacks, cream jars, makeup bottle, coins, watches,chains, bracelets, sachets and other small items that you want to. - Ideal for Halloween, party, wedding and Festival, celebration and other occasions. -These are made of sturdy burlap and feel very nice to the touch. -Inner is made of soft material which prevent scratching or keeping items clean when storing. - It is easy to open and close with the strings, so it makes it easier to put or remove items from this pouch. -The bag size is approximately 7.1* 4.9 inch. 24 Hours Customer Support: Contact us freely about any product or order problems,we will reply with superb service. 30 Days Money-back Guarantee: If you are not satisfied for any reason, just return for a refund of your purchase price. 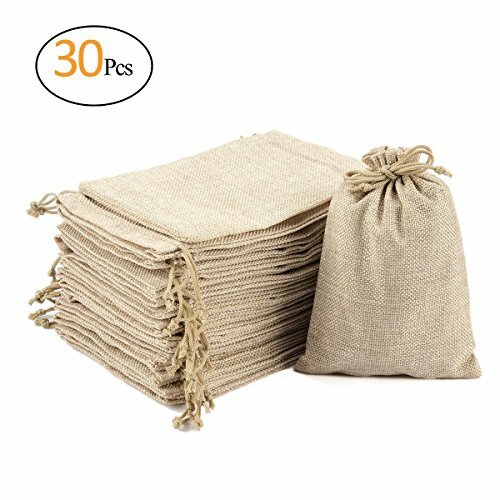 DIFFERENT OCCASIONS: 30 pcs burlap bags are suitable for wedding favor, shower, party, festival, celebration, crafting and DIY design projects and more. MULTI-FUNCTION: It is a great size (approximately 7.1" * 4.9") to store gifts, jewelry, coffee beans, seed, makeup bottles, snacks, money, candy, cream jars, coins, chains and other small items that you want to, and prevent scratching or keeping items clean. UNIQUE THE DESIGN OF DRAWSTRING: These bags with drawstring make it easy to fasten and loosen, which tightly bag closed to avoid small items lost. STURDY MATERIAL: These are sturdy and environmentally friendly burlap which can be reused for longer and feel very nice to the touch. SOFT INNER: The material of inner feels soft that prevent scratching or keeping items clean when storing. If you have any questions about this product by ANPHSIN, contact us by completing and submitting the form below. If you are looking for a specif part number, please include it with your message.